The Ford Ranger, one of the top selling cars in the country offers a great model range from every day workhorse through to flash weekend warrior. But being one of the most popular cars on sale means there’s a lot of them out there. What if you want yours to be a little different? A little more power, a meaner more muscled up look or a slightly nicer interior but all without voiding your warranty. 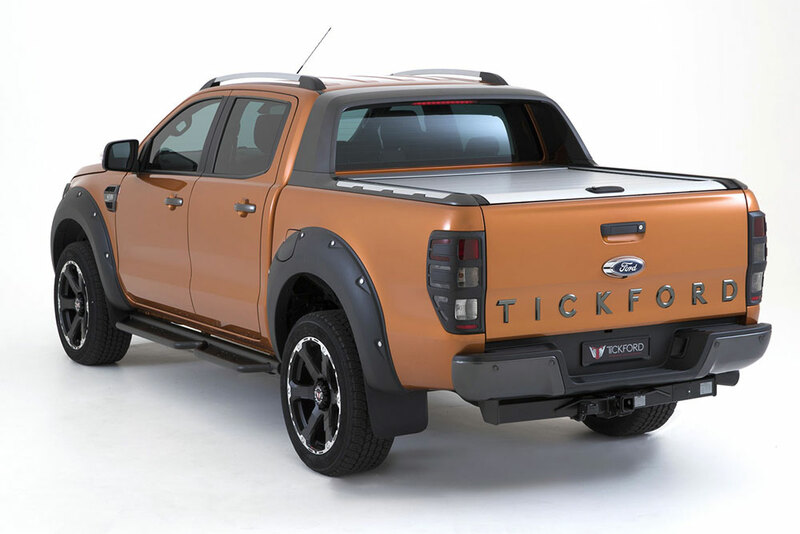 Tickford – better known for hotting up V8 Falcons in the 90’s and early 2000’s have made a come back and they’ve got the current Ford lineup in their sites. 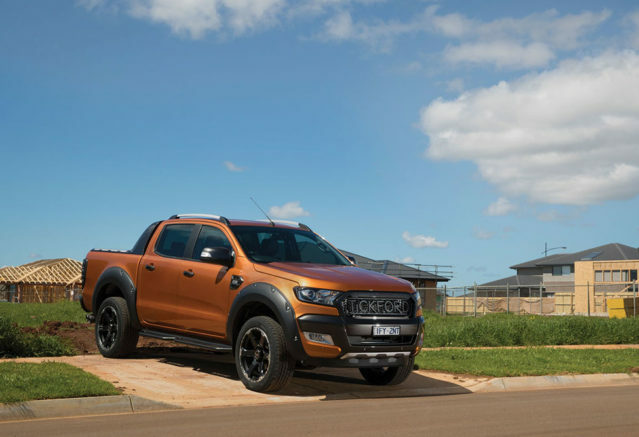 Kicking off with the Ranger, they’ve created an extensive collection of upgrade packages which you can buy as stand alone items, or take the whole lot to give you the ultimate Ford Ranger. Very few would say the Ranger is under powered. Rolling out of the showroom with 147kW and 470Nm give the Ranger ample power to make the most of its 3,500kg towing capacity. But more is always better isn’t it, especially when you’re towing boat or caravan. 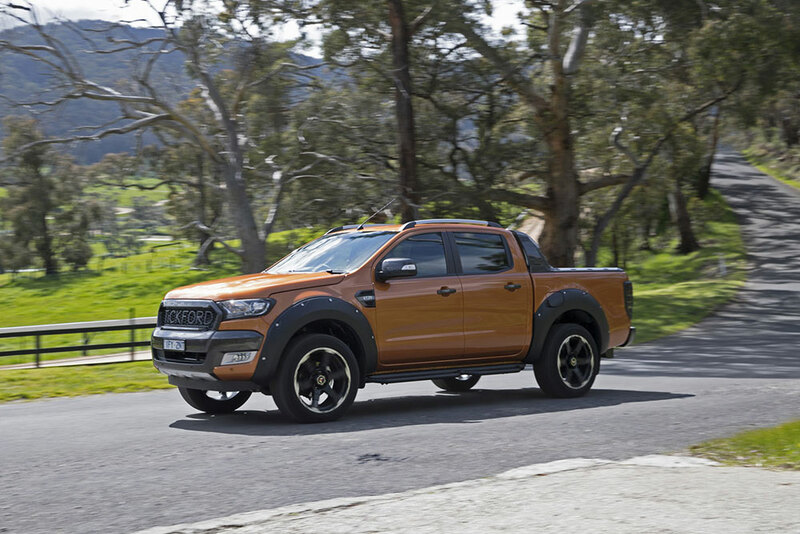 Backed by Tickford’s own driveline warranty which covers the balance of the new car warranty on your Ranger, you’ll get 15% more power and a whopping 20% more toque bringing the figures up to 169kW and an almost everything beating 564Nm of torque. What does the package include to get those figures safely enough to put a warranty on it? 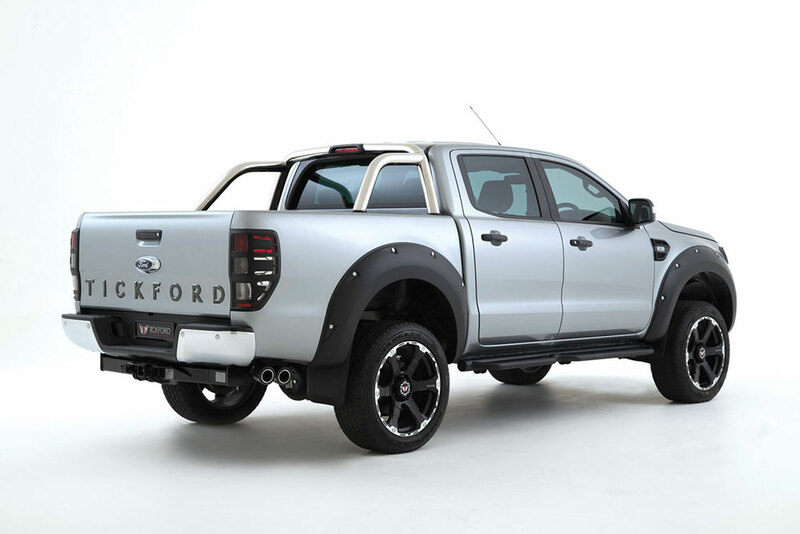 A number of new components and updates including Tickfords own Performance Diesel Tune, larger intercooler and hard pipe kit, 2.5 inch Tickford stainless steel cat-back exhaust system with dual side outlet exhuast tips wrapped in carbon, a high flow long life air filter, plus bold Tickford badging for the tailgate. Aside from increased peak power, the power pack also offers improved driveability and for some users you may also see a decrease in fuel consumption. 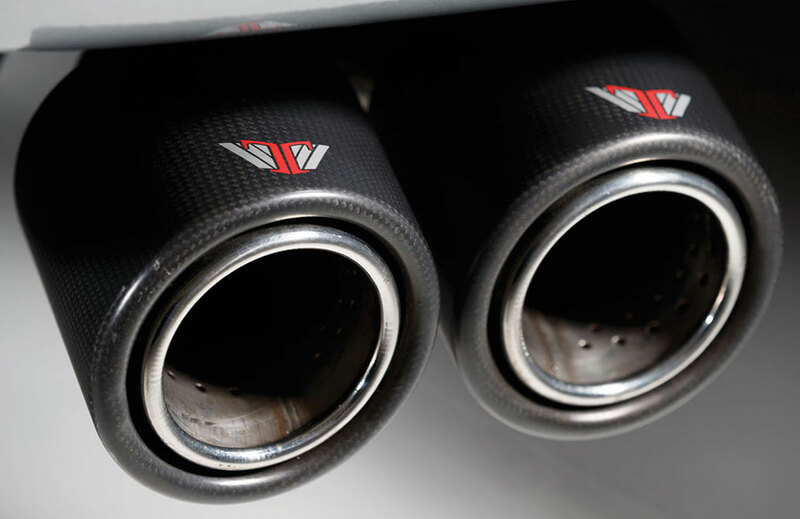 Should you just want the 2.5 inch cat back exhaust that makes up part of the Power Pack, Tickford are happy to oblige and give you the exact same system with dual side outlets and carbon wrapped tips. The ehxuast also includes a Tickford Performance muffler, Tickford interior badge and a 12 month warranty on all parts required. 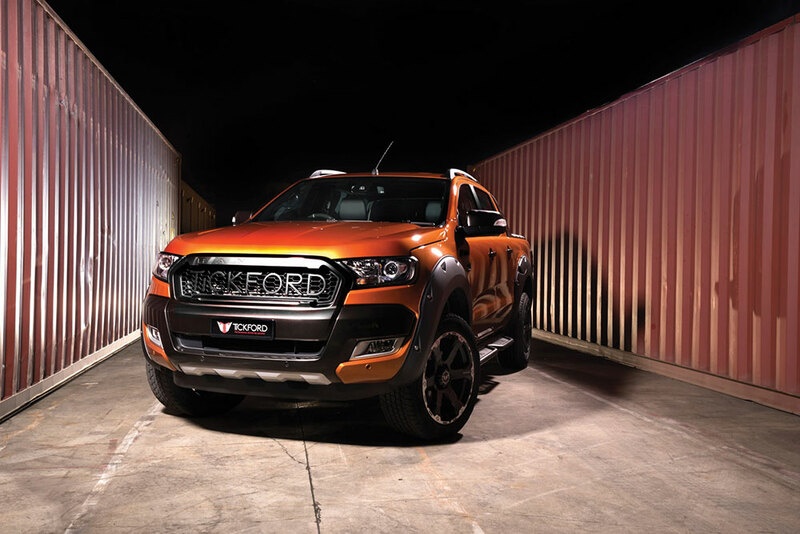 The Ranger Wildtrak is already an imposing presence on the road, but beside the Tickford Ranger, it’s almost relegated to the shadows. A big set of flares over a big set of wheels dominates the external appearance of the Tickford Ranger making it look less suburban workhose and more about getting down to dirty business. The wider track and increased footprint has been tested by Bosch Automotive, ensuring the Ranger’s already impressive safety systems continue to operate as intended. 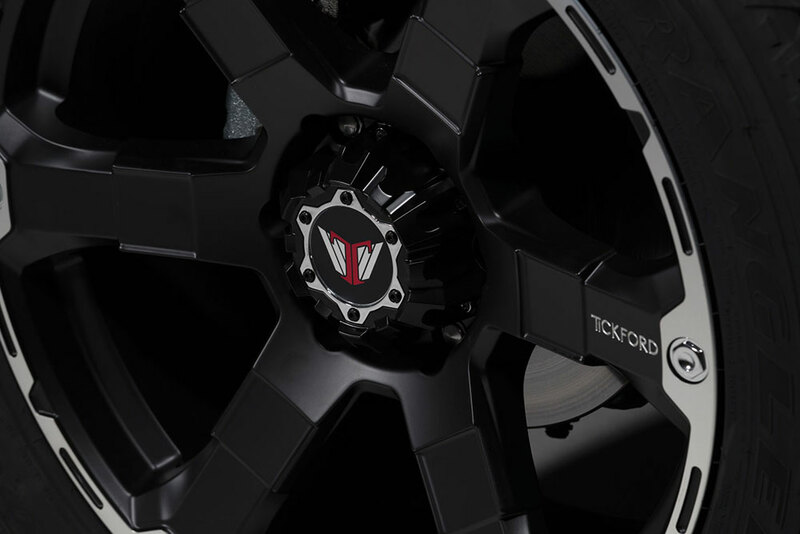 The kit includes a set of 4 20×9 inch Tickford alloy wheels wtih 265/50/R20 Goodyear AT Tyres, satin black Tickford fender flares, Tickford centre caps and a tyre pressure warning system. The flare kit can also be purchased separately from the wheel and tyre kit if you have your own set in mind. 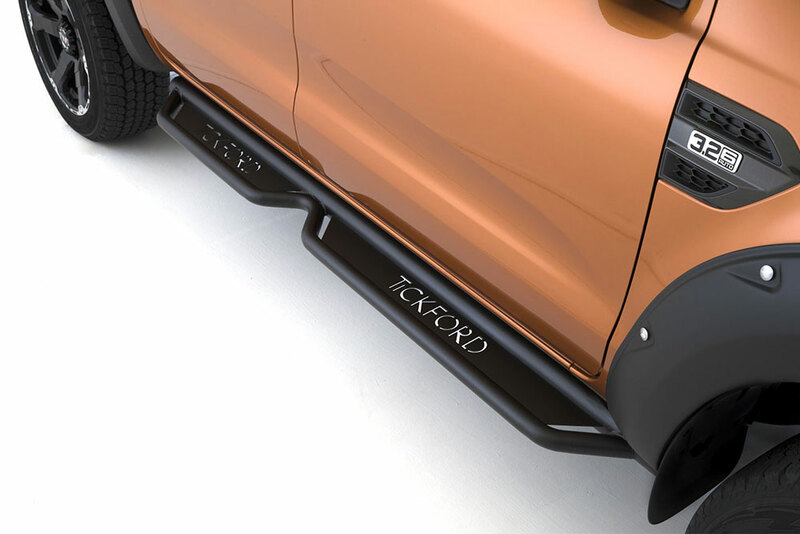 Tickford’s Ranger Lift Kit provides a 2-inch lift over standard whilst maintaining a sure-footed, safe and compliant drive which brings an improved feel and greater cornering ability on-road without compromising the off-road ability of the standard vehicle. The kit includes replacement front and rear dampers from Bilstein, spring height raised by 2 inches (50mm), a centre bearing spacer kit and a greasable rear bush kit to allow the drive shaft to be correctly aligned. Central to Tickford’s core engineering principles, the Ranger Lift Kit has undergone and passed independent testing conducted by Bosch Automotive. 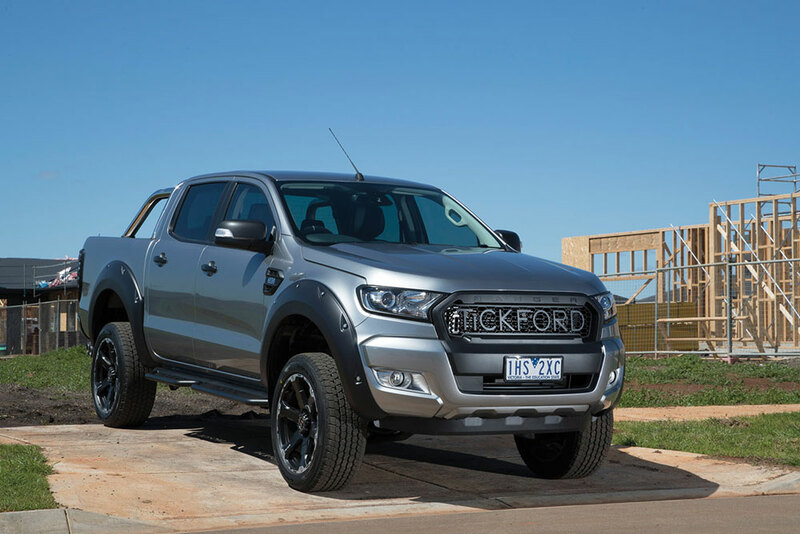 The testing concluded the combination of Tickford’s ride and handling products passed Australian Design Rule 35/05 – a standard which all Original Equipment Manufacturers (OEM) must comply with. Don’t want a lift kit but would like to make your Ranger ride better? The sport suspension package includes front and rear Blistein replacement dampers built to Tickfords specifications for improved on road handling, grip and feel. Tuned specifically for Australian roads and keep your original ride height. Road presence, something the Ranger already has in spades but take it up another step with Tickfords deep set grille. Made from high quality injection moulded plastic, no only do you get a sinister look you’ll also benifit from improved airflow to the engine bay, just what you need towing a heavy load uphill on a hot summers day. The grille comes finished in satin black. Also available is a matt black grille surround should you want to change out your standard item. The crucial finishing touch to any decent ute are side steps. Designed to match the exisiting factory mount points on the dual cab Ranger, these are built from e-coated mild steel and finished in black powdercoat. Designed to cope with the worst Australian conditions these steps will give you better clearance than standard and a far superior look. Who doens’t like a sports bar on a ute? finish the look of your Ranger by elongating the visual lines. The sports bar keep all factory mounting points and lighting hardware and is finished in black powdercoat. A matching soft tonneau cover is also available. If a leather interior is what you were always chasing for your Ranger, you’ve come to the right place. 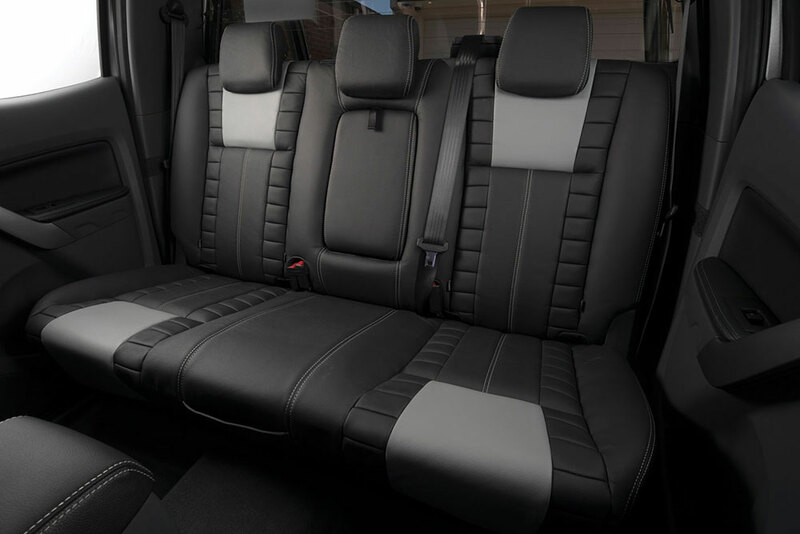 Tickford interior package is made up of OEM grade leather, perfectly trimmed for your Ranger. 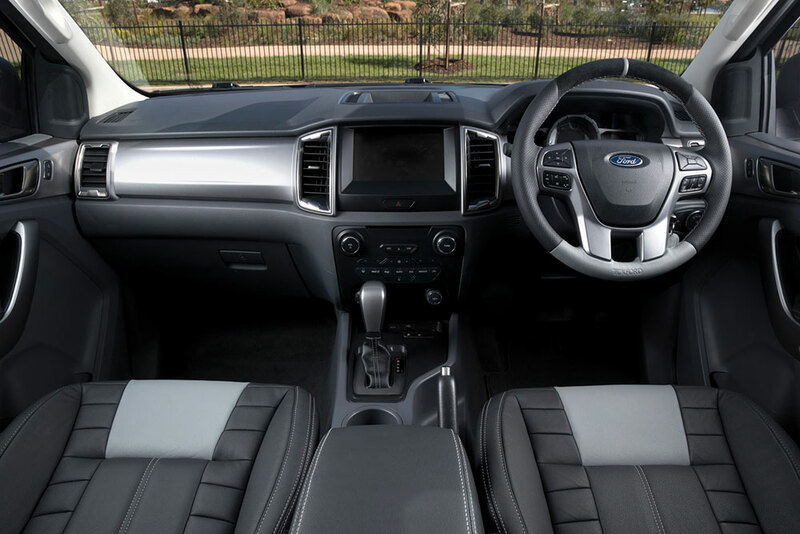 it includes front and rear seats, designed and tested to ensure there is no problems with air bag deployment, plus leather coverings for the centre console and door inserts. Optional extras include a perforated leather and suede steering wheel and Tickford door sill plates. 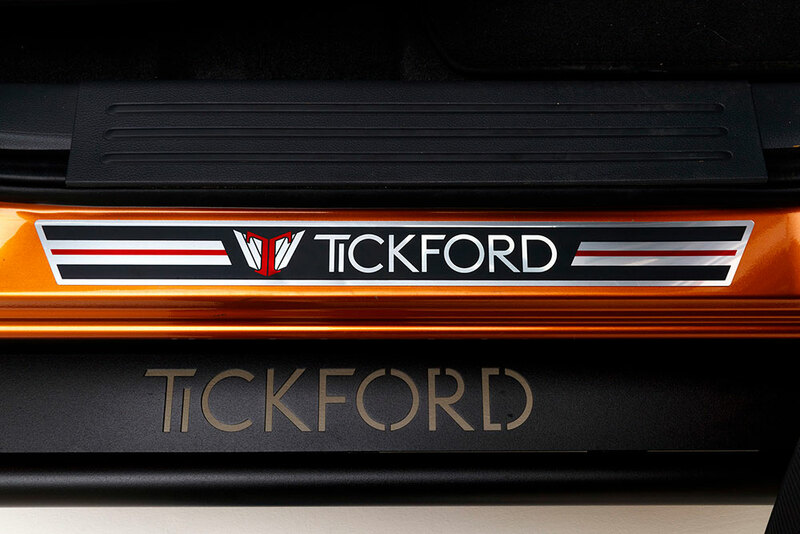 Kits are availalbe to be fitted here in Perth with no need for your car to go to the Tickford factory in Melbourne. 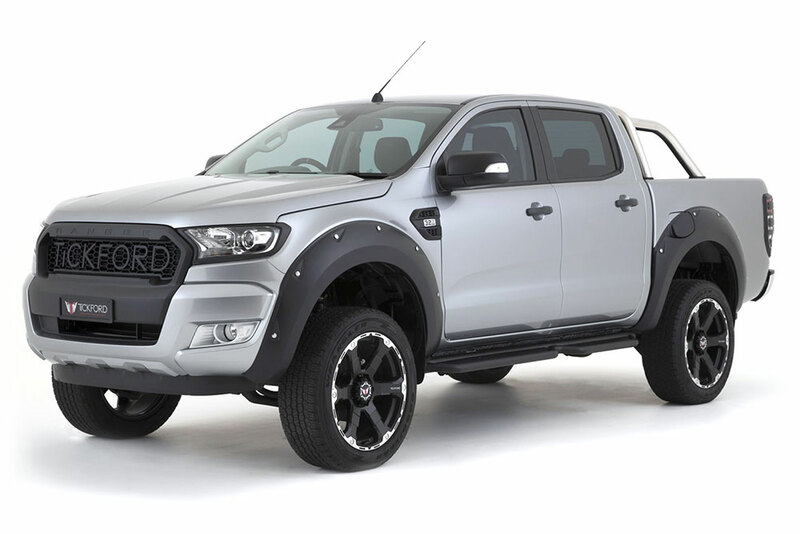 Contact us today to build up your perfect Tickford Ford Ranger.